If you have never heard of earth sheltered homes that's ok, it occupies a curious hole in the knowledge base of many people in this country. In the United States we have grown accustomed to a system of home building that has giving us suburbia, urban sprawl, an astonishing amount of trash and or course the lovely utility bill. Many people are convinced that this is the only way to build and live in the modern world. Well luckily for us that is just not the case if you are willing to think outside the box (pardon the cliche) and to dig a little deeper (whoops did it again) into the idea of earth sheltered home. 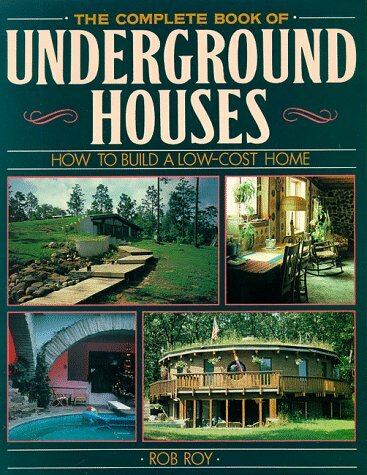 If you want to learn more right this minute on the merits of earth sheltered homes please read on as I pull a few diamonds out of the rough ( I really have to stop I'm sorry) and present them for your consideration. I believe I mentioned something about utility bills above and I think that this diamond deserves to be brought to the top of the list. When it comes to my monthly utility bill I want them to be a small as possible and I think pretty much everyone can agree on me with that. I mean have you ever been standing in line at the grocery store and heard someone complain about a small heating and cooling bill they have to pay I don't think so. I bet a lot of you are wondering how burying your house in the ground could possibly help you lower your heating and cooling bills. Wells it works because unlike on the surface of the planet with its widely fluctuating temperatures, the temperature just a few feet below ground is a bit more steady. Depending on where you are on the planet the steady temp in the ground will be around +/- 50 degrees. For how this can help you lower your heating and cooling bills consult the diagram below. Since the earth is always a steady temperature you can always count on it rain or shine to be giving you that temperature. When built correctly a earth sheltered house can be cooled completely by the earth and can have anywhere from 50-100% reduction in the heating bill. Using the earth to protect your dwelling can provide an unrivaled amount of protection for pennies on the dollar. Properly graded, sloped and drained a thick soil cover on your walls and roof will protect your house from wind, hail, rain, snow and pretty much else anything else the world can throw at it. Since most underground homes are built of materials such as poured concrete, rammed earth tires or concrete blocks once they are installed they will require very little maintenance. One of the major issues that do face underground homes is water. If you wish to make sure your home will be relatively maintenance free you must pay special attention to water and the damage it can do. A well-drained drained site with the right catchments and water diversions can protect your house and give it a life measured in centuries not just decades. Designing and building a house like this can be very environmentally friendly or not depending on what you use. Techniques that used rammed earth tires, earth bags or even natural stone can have very little impact on the environment and still create a very strong durable structure. In addition if you go with a fully covered structure you can plant grasses, flowers and maybe even a garden. If you so desire you can completely camouflage your house so that nobody would even know it is there. Nice job. Clearly not just a rah rah treatment with a balance of pros and cons. Once lived in an underground house (well about 4 feet stuck above the ground) and it was cool in the summer and warm in the winter. I to have had the luck of living a in earth sheltered house and I hope to once again. I really think that earth sheltered homes could be a viable part of future home building. Better fix your title: it's "an Earth" not "a Earth". Thanks for the heads up I make that mistake quite often unfortunately.